Amity Institute of Pharmacy, Amity University, Noida - 201303, Uttar Pradesh, India. ABSTRACT: Rheumatic heart disease (RHD) is a major burden in developing countries and leads to heart valve damage resulting from acute rheumatic fever (ARF). RHD and its complications cause more than 1.4 million deaths per year, globally. The mortality in RHD depends on the factors related to socio-economic status and tertiary care, especially in developing countries like India. In this study, a comparative analysis of the socio-economic status of RHD patients in a tertiary care hospital is done, and the prevalence of RHD in different aged patients is explored. A total of 96 RHD patients were included in the study with a mean age of 50.89 ± 14.62 (30-79) years. The average heart rate (HR) and ejection fraction (EF) of RHD patients were 90.15 ± 24.77 (46-160) and 55.61 ± 10.93 (23-70), respectively. It was found that only 87.50% patients were a complaint on follow up visits, out of which 39.58% were in age group 30-45 years, 37.50% were in age group 46-60 years, and 22.92% were above 60 years. The reasons for non-compliant patients include the long distance between the hospital and their native place, change of consulting hospital/doctor, high price medications and premature death, etc. This study reveals a high prevalence of RHD in people aged 30-60 years as compared to older age group. Moreover, increased morbidity is observed in female patients relative to their male counterparts. Majority of patients were compliant to RHD prophylactics during follow-ups, which ensures the quality of drugs prescribing patterns at the considered tertiary care hospital. INTRODUCTION: A non-communicable disease like Rheumatic heart disease (RHD) has been rising tremendously and it has become one of the major health concerns today. An abnormal behavior to bacterial infection by Streptococcus pyogenes bacteria leads to RHD 1, which further results in heart failure (HF) and early death. The RHD patients generally suffer from the recurrent attacks of rheumatic fever (RF) leading to consequent valvular damage 2. Later, as the disease grows, surgery becomes the only solution. Patients with low socioeconomic profile normally die prematurely from RHD, due to unaffordable treatment 3. Worldwide, RHD is a major burden in developing countries that causes more than 1.4 million deaths per year, globally 4. RHD is often taken as a neglected disease by media and policy makers 5. It has been discussed in 6 that the mortality in RHD depends on the socioeconomic status, valvular damage severity, and factors related to tertiary care, especially in developing countries like India. Due to good living conditions, the people in developed countries have a low incidence of RHD as they have better and timely access to required prophylactics. The improved facilities of sanitation, nutrition, and environment at tertiary care can also reduce the burden of RHD 6. A study of RHD patients from Uganda shows high morbidity and mortality due to poor adherence to penicillin 2. According to a study based out of Indonesia 7, the prevalence of RHD is high among adults as compared to youngest age group. This study intends to find the compliance of RHD prophylactics at a tertiary care hospital. It also provides the age (and gender) wise prevalence of RHD. Study Design and Place of Research: It is prospective and retrospective study carried out in In-patient department (IPD) at National Heart Institute (NHI), East of Kailash, New Delhi. This is a hospital-based descriptive study carried out during Jan. 2015 to Dec 2016, which included 96 patients with clinical evidence of RHD. A follow up of 12 months is considered, and compliance to RHD prophylactics is studied. Ethics Approval: The study was conducted after obtaining permission from Scientific Advisory, Research & Ethics Committee, All India Heart Foundation, New Delhi (in their meeting held on 15.05.2015) and hospital administration. For prospective cases, the verbal consent of patients has been recorded for the study purpose. Inclusion Criteria: The patients with confirmed RHD (diagnosed by the echocardiographic report and other clinical parameters) between the age of 30-80 years are considered. Exclusion Criteria: The patients who do not satisfy the inclusion criteria and incomplete case records are excluded from the database of the study. Data Collection and Interpretation: A data collection form is designed to record the patient information from OPD/IPD cards or files. The major information recorded in the data collection form includes gender, age, religion, socioeconomic status, literacy level, lifestyle, prescribed medications, and lab reports. The well-known Kuppuswamy’s scale 8 is used to classify the socioeconomic status. It considers the educational background, family occupation and monthly income of the patient for defining the socioeconomic status. The data recorded manually is then converted into an excel sheet, and a master chart is prepared. Methodology: During the study, 96 RHD cases are recorded considering the echocardiographic report for evidence. The patients’ data is divided into three non-overlapping age groups like Group A (30-45 years), Group B (46-60 years) and Group C (>60 years). The number of patients is recorded according to their socioeconomic status, literacy level, and lifestyle. The major drug groups for RHD patients under primary prevention include Antibiotics, Diuretics, Digoxin and Anticoagulant. The Benzathine Penicillin injection is commonly prescribed under secondary prevention mostly for adults. Based on the number of drugs prescribed to different age groups, the compliance (number of patients showing the adherence to the medication) is monitored. Moreover, the sample data is examined for comorbidities associated with RHD. Statistical Analysis: The statistical analysis is performed over the data collected for RHD patients. The chi-square test is utilized for obtaining any relation in different categorical variables. The contingency table is prepared to obtain the associated x2 value and p-value. Socio-Demographic and Clinical Characterization: Table 1 gives the detailed distribution of patient data with different age groups. It is clear from Table 1 that the socioeconomic status of the majority of patients is low (44) and middle (37). Moreover, most non-complaint patients (9 out of 12) lie in the low socioeconomic status category, which depicts the impact of socioeconomic status on the prevalence of RHD. It is by the results available in literature 6 that the patients with low socioeconomic status are relatively more non-complaint as compared to the patients with higher socioeconomic status. Further, it can be observed from Table 1 that the patients with basic or intermediate literacy levels have low adherence to medication as compared to the proficient ones. Moreover, the lifestyle of patients under observation has been examined, and it is found that 4 and 6 cases (out of total 12 non-compliant cases) under active and strenuous category respectively have poor adherence to RHD medication. Table 2 shows the distribution of drugs prescribed under different age groups. It can be obtained from Table 2 that an average number of drugs prescribed to age group A (30-45 years) is 12.34 with a standard deviation (SD) of 4.81. However, the average number of drugs for other age groups are slightly higher, e.g., 14.36 for age group B (40-60 years) and 14.41 for age group C (>60 years). Moreover, the patients with more drugs were majorly more non-compliant. The distribution of comorbidities is shown in Table 3. The presence of comorbidities in 27 (out of 33) male and 54 (out of 63) female patients is noted. The female patients have slightly more comorbidities (85.71%) as compared to the male patients (81.82%). However, the majority of patients from both genders have one or two comorbidities. 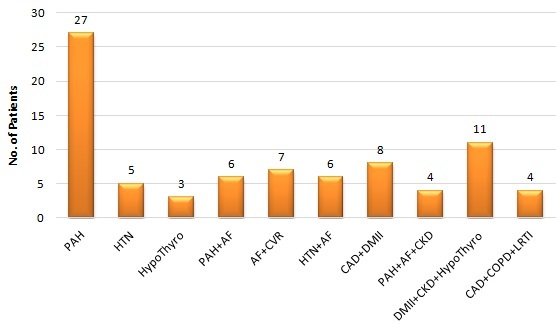 The typical comorbidities present in the sample data are given in Fig. 1. 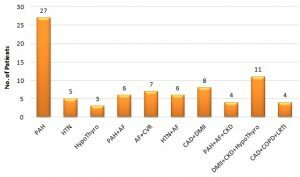 The major comorbidity observed is Pulmonary Arterial Hypertension (PAH) (33.33%) followed by a combination of Diabetes Mellitus Type II (DMII) + Chronic kidney disease (CKD) + Hypothyroidism (13.58%). Other main comorbidities (single) present in the patient pool include Hypertension (HTN) (6.17%) and Hypothyroidism (3.7%). Statistical Characterization: The Chi-square test for independence is performed over the different categorical variables (e.g., gender, socio-economic status, literacy level, and lifestyle) from the sample data. It is assumed that the significance level is 0.05 for this test. The degree of freedom for all three contingency tables given in Table 4 is two. The p-value here represents the probability that a chi-square statistic having 2 degrees of freedom is more extreme than the obtained χ2 value. The p-values obtained by performing the chi-square test for gender versus socio-economic status, literacy level, and lifestyle, are 0.8, 0.96, 0.9, respectively. Since all the three p-values are more than the significance level (0.05), the null hypothesis is accepted. This implies that socio-economic status, literacy level and lifestyle of patients are independent of their gender. However, high p-value (greater than the significance level 0.05) also suggests that the test (or data) is not statistically significant. CONCLUSION: In this study, sample data of 96 RHD patients from a tertiary care hospital in Delhi is analyzed. The study reveals a high prevalence of RHD in the population aged 30-60 years as compared to patients of more than 60 years of age. Moreover, increased morbidity is observed in female patients relative to their male counterparts. Majority of the patients were compliant to RHD prophylaxis during follow-up visits. Further, the sociodemographic parameters such as literacy level and lifestyle have no direct association with male or female patients. The study also shows the quality of both primary and secondary drugs prescribing patterns which upheld the standard guidelines at the tertiary care hospital under consideration. The quality of preventive measures used and adherence to proper guidelines are important tools for reducing the burden of RHD in almost all age groups. ACKNOWLEDGEMENT: We are thankful to the management of National Heart Institute for providing infrastructure for carrying out this study. Carapetis JR, Steer AC, Mulholland EK and Weber M: The global burden of group A streptococcal diseases. Lancet Infect Dis. 2005; 5(11): 685-694. Okello E, Longenecker CT, Beaton A, Kamya MR and Lwabi P: Rheumatic heart disease in Uganda: predictors of morbidity and mortality one year after presentation. BMC Cardiovascular Disorders 2017; 17: 20. Reményi B, Carapetis JR, Wyber R, Taubert K and Mayosi BM: A Position statement of the World Heart Federation on the prevention and control of rheumatic heart disease. Nat Rev Cardiol 2013; 10(5): 284-292. Paar JA, Berrios NM, Rose O, Cáceres M, Peña R and Pérez W: Prevalence of rheumatic heart disease in children and young adults in Nicaragua. The American Journal of Cardiology 2010; 105: 1809-14. Kumar RK and Tandon R: Rheumatic fever and rheumatic heart disease: The last 50 years. 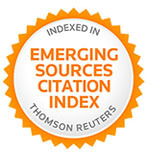 The Indian Journal of Medical Research 2013; 137(4): 643-658. Talwar KK and Gupta A: Predictors of mortality in chronic rheumatic heart disease. The Indian Journal of Medical Research 2016; 144(3): 311-313. Rodriguez-Fernandez R, Amiya R, Wyber R, Widdodow W and Carapetis J: Rheumatic heart disease among adults in a mining community of Papua, Indonesia: findings from an occupational cohort. Heart Asia 2015; 7(2): 44-8. Shaikh Z and Pathak R: Revised Kuppuswamy and B G Prasad socio-economic scales for 2016. Int J Community Med Public Health 2017; 4: 997 9. Bansal K, Rajput SK, Sharma V and Mathur VS: Comparative analysis of socio-economic status in RHD patients: a tertiary care interpretation and exploring reasons to improve adherence. 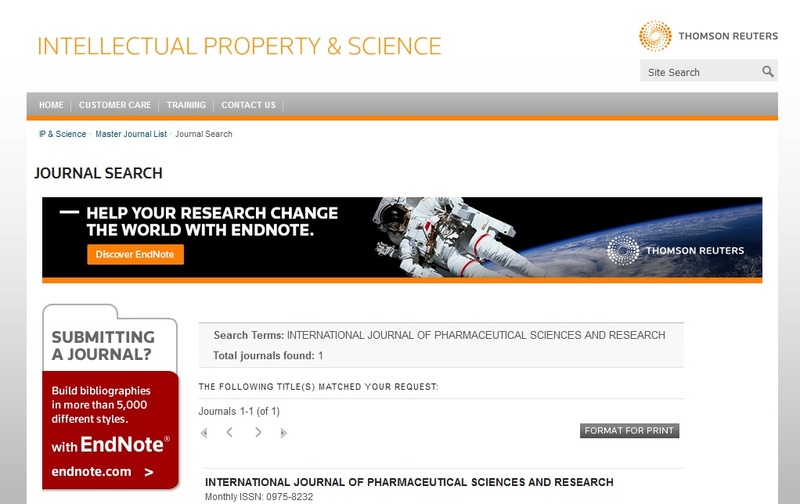 Int J Pharm Sci & Res 2019; 10(2): 790-94. doi: 10.13040/IJPSR.0975-8232.10(2).790-94.